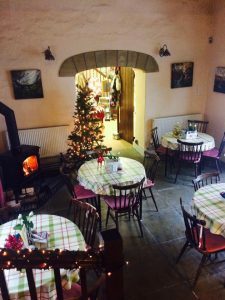 The Hemmel Cafe is set in the beautiful North Pennines which is an area of outstanding natural beauty and possibly one of the last places to catch a glimpse of the red squirrel. It is an excellent location for Tourists, Walkers, Cyclists & (weather permitting) Skiers. For cyclists, it is on the C2C; for skiers and snowboarders, it is less than a 200 metre walk to the Ski-Allenheads slope. Fish and chips on the first Friday of each month – Phone 01434 685568 to book a table or order a take away slot. Get in early every month as its very popular. Sunday lunches between 12 noon – 3pm every week. To book a table call 01434 685568. 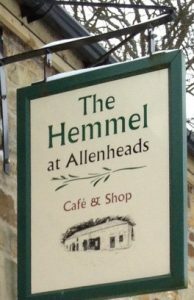 The Cafe is in the middle of Allenheads and very easy to find – see Where We Are for how to find us. 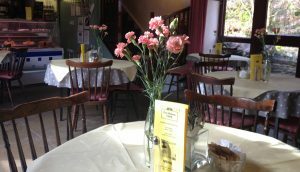 We have a well appointed cafe downstairs, complete with wood burning stove, plus a comfortable library & lounge area overlooking the main room. Free wi-fi is available throughout. There is a large, secluded outdoor area, including a play area for the children.